LuLaRoe owes supplier $49 million, Stidhams threaten a runner? If a recently filed lawsuit by their supplier Providence Industries MyDyer is to be believed, LuLaRoe’s owners are sitting on hundreds of millions of dollars. MyDyer and other suppliers are owed tens of millions, which Mark Stidham has told them he has no intention of paying. LuLaRoe is a Californian MLM company headed up by husband and wife co-founders, Mark and DeAnne Stidham (right). Mark Stidham is also LuLaRoe’s CEO. Providence Industries (dba MyDyer) allege that as per an agreement entered into in April 2016, MyDyer fulfilled LuLaRoe orders with payment due via invoice within seven days. Additional debts of $1 million owed to UPS and $3.1 million owed to third-party suppliers are also detailed. A Minimum Purchase Commitment between LuLaRoe and MyDyer requires the former to provide a semi-annual written report. The report is to verify LuLaRoe’s adherence to the commitment over the past six months. since August 2018, LuLaRoe has been ordering substantial products from other suppliers. Specific suppliers named are Creative Apparel LLC ($3.2 million), Mad Engine LLC ($2.4 million), RSGA Incorporated dba InnovAsia ($18.4 million) and Zam Brand Inc. ($5.3 million). MyDyer allege that in November 2018 alone, LuLaRoe ordered over $10 million from their new suppliers. MyDyer believes that LuLaRoe are seeking to hide from (them) information regarding LuLaRoe’s purchases from other suppliers by refusing to provide the semi-annual reports or otherwise make its books and records available to MyDyer. Additionally, MyDyer has serious concerns that LuLaRoe are diverting to third parties (including to other suppliers) the funds that they owe to MyDyer. MyDyer believes one reason LuLaRoe might be “unable or unwilling” to pay them is “mounting financial difficulties”. Specifically, in approximately April 2017, LuLaRoe’s business suddenly took a turn for the worse when they changed their policy for paying bonuses to their “independent fashion consultants”. Among other things, LuLaRoe ceased paying bonus checks to its consultants based upon the number of products ultimately sold to the consumer. As a consequence of the bonus policy change, MyDyer has recently been informed that by August 2017, LuLaRoe’s monthly revenues dropped in half from approximately $200 million per month to $100 million per month, and a large number of consultants began leaving LuLaRoe. Around the same time frame, from April 2017 through approximately September 2017, LuLaRoe also instituted a 100% refund buyback offer for its consultants. As a consequence of that policy, LuLaRoe has paid approximately $120 million in returns to its consultants. MyDyer allege that despite all of this, LuLaRoe continued to place orders worth tens of millions of dollars, all the while failing to disclose their financial troubles. Because LuLaRoe has failed to be the indebtedness for many months, appear to have many other creditors and lawsuits pending with what MyDyer is informed involve hundreds of millions of dollars in claims, MyDyer has reason to believe that LuLaRoe are insolvent. Making matters worse, as to the tens of millions of dollars of products that LuLaRoe has received and accepted, MyDyer believes that LuLaRoe has sold the products and absconded with the proceeds of the sale. MyDyer is informed and believes that LuLaRoe are using the proceeds of sale to fund the lavish lifestyle of LuLaRoe’s principals, as well as to pay for new products from other suppliers (in breach of LuLaRoe’s agreement with MyDyer), in order to generate further revenues for the personal enrichment of LuLaRoe’s principals. pictures of his multi-million ranch property in Wyoming, and stated that he was going to buy a neighboring ranch property adjacent to his current ranch in order to gain exclusive access to the river running next to the two branches. Stidham also owns two Koenigsegg luxury cars, a $700,000 CCX and a $2 million+ Agera RS, which were purchased through the shell companies Ghost Squadron and Inland Exotic. LuLaRoe has allegedly purchased or has set aside funds to purchase private airplanes, through the shell company 159DE. Real estate tied to LuLaRoe are identified, purchased in the names of Lennon, Hudsloan Land, Carolina Pines, 823 Ringdahl Circle LLC and 4048 Suzie Circle LLC. 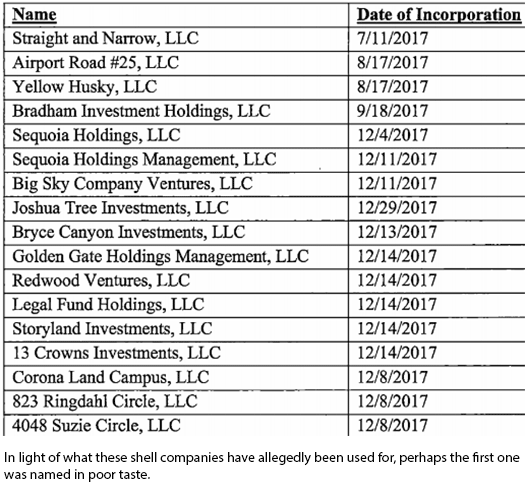 MyDyer claims the Stidhams’ and LuLaRoe’s use of shell companies is to ‘shield such assets from MyDyer’s creditors‘. MyDyer believes that LuLaRoe, through Mr. Stidham and Ms. Stidham [sic], have created dozens of additional shell entities, which MyDyer believes are part of a scheme to hinder, delay and defraud creditors of MyDyer and Mr. Stidham and Ms. Stidham [sic]. Records provided show most of the entities allegedly used were incorporated from mid 2017, shortly after LuLaRoe made changes to its compensation plan. which would delay MyDyer’s California creditors from enforcing their judgment rights against LuLaRoe. In September 2018 MyDyer finally approached Mark Stidham over LuLaRoe’s mounting debt. While I was flying with Mark Stidham in his jet in 2018, Mark complained about the conduct and accusations by the (consultants), and he told me that he could just “jump ship” from LuLaRoe and that he would take hundreds of millions of dollars from LuLaRoe and move to Wyoming or the Bahamas with DeAnne. This was not the only time he made such statements to me, and he would frequently tell me that he would leave the company and take its money out for his and his wife’s personal benefit. Winget was hired by LuLaRoe for Chief Merchandising Officer as their “fifth or sixth employee” in 2013. Around June 2018, in a meeting I had with Mark Stidham and his son-in-law, Michael Brady, Mark complained to me that the costs of production with MyDyer were “too high”. Michael claimed that he had located a supplier that could sell the garments at half the price. I was very concerned about the quality of such products and the factory conditions, and I explained to them that buying cheap garments was like buying $2.99 shrimp in Las Vegas, and that the clothes and the factories would be in bad condition! I was very concerned about Mark Stidham’s attitude and the impact such new products would have on LuLaRoe. Around July to August 2018, I was frequently out of the office and was taking care of my sick monther. I was gone for weeks at a time. While out of the office, I received a phone call from Mark Stidham for confirming to MyDyer, in writing, to LuLaRoe’s prior verbal requests to destroy products. He accused me of being his “enemy”. At the insistence of Stidham, Winget resigned from LuLaRoe on September 5th, 2018. MyDyer have pegged the total amount LuLaRoe owes them at $48.7 million. The company sent LuLaRoe a letter demanding payment on October 31st, which has now been followed by their November 26th lawsuit. We believe the claims in this case are completely without merit and will fight vigorously against them. On or around December 4th, MyDyer filed for an ex-parte appointment of a LuLaRoe Receiver and writ of attachment (asset seizure). Footnote: Our thanks to LuLaRoe Reddit, through which both MyDyer’s original complaint and Patrick Winget’s declaration were sourced. According to Winget’s sworn statement, LuLaRoe’s monthly revenue abruptly dropped from roughly $250 million to $100 million in mid-2017 after it changed the structure of its bonuses. These bonuses had previously been paid to sellers, also called consultants or retailers, based on how they purchased wholesale from LuLaRoe. The new structure instead based bonuses on retailers’ sales to customers. Proving yet again that MLM is inherently flawed and not a retailing business. It’s a pyramid scheme i.e. multi-level recruitment based Ponzi with a cover product. Threatening to do a runner. I am shocked that they haven’t done a runner by now. We are now into Black December and would not shock me if they just disappear in the next few weeks. Doing a runner is the ultimate LuLaRoe end-game in this scenario. The Stidhams would be hunted down by US authorities if they were to follow through. The Washington State Attorney General’s Office appears to be investigating the multilevel marketing company LuLaRoe, sources with knowledge of the investigation told Business Insider. The agency has helped secure refunds over several months — some worth thousands of dollars — for former sellers of the company’s clothing who reside in Washington, according to five former consultants who said they were recently contacted and interviewed by an investigator with the agency. Topics covered during these interviews were wide-ranging and included LuLaRoe’s business practices, ordering processes, and quality issues with the company’s clothing, sources said. Two people said investigators have obtained data, including consultants’ sales numbers, from LuLaRoe. Interesting development in that they’re assisting affiliates with refunds. The Washington State Attorney General’s Office said it doesn’t comment on the status or existence of investigations. LuLaRoe did not respond to a request for comment. Going to hold off until absolute confirmation but where there’s smoke there’s usually fire.